Barbara Rae of Goal for the Green have given me a Lemonade Award!!! Isn't she sweet?? She even said that she "really enjoy" my blog! Whew! That definitely brightened my day! Thanks a lot my friend! 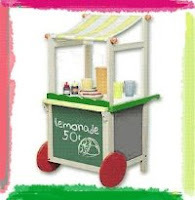 And oh, I can also make use of the lemonade cart when selling my sandwiches! Lol! 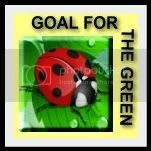 Goal For The Green is a blog that talks about para educational materials, green living, and a bit of politics thrown in. You will really learn a lot from this blog! Please visit Barbara Rae's page by clicking on the badge! You have a nice little business going. lemonade and sandwiches. hahahahhaaha. and thanks again for the lemonade award. i haven't got time to update my blog but you're one one of the blog i check everytime i log in. You're welcome!I love your blog title, Flo! It seemed very artistic! hahaha! Soulful Scribbles! Love it! Hahaha! I wish I can bring that cart at work, Bill! Thank you Ran!!! Ahhh... That's so sweet of you! My blog layout is courtesy of my friend Ivy of the Designer Chic. Thanks to her for the beautiful layout! It is such an honor to get an award from you! Thanks so much. I really appreciate it. You're very much welcome! Take care!